I love the doorknobs in my home. There are many. All the rooms have french doors that open onto a balcony. I counted all the doors – 12 of them. So I decided to draw them. I also enjoy hanging stuff on to the doors, as you’ll see and that changes with every whim. 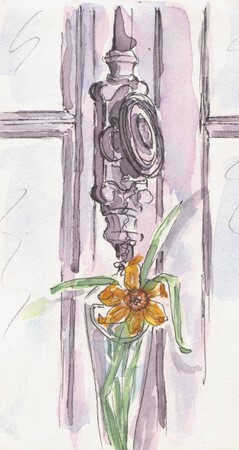 In the guestroom, always a flower glass with something from the garden, in this case a daffodil. In the bathroom, an old star made from recycled tin, which I bought from an old retired farmer, when we lived in South Carolina…I can still hear him say with a long, southern drawl: “Oh, lordiee, lordiee..” What a fun old man he was! Then the market basket is always on the ready at the living room door. And here comes a little cheating as well…a door yes, but not really a doorknob, only a huge, beautiful old key. I used an old door I found at the back in one of our caves and made a bulletin board out of it, on which I hung this key and a wooden “Bonheur” heart, which really does give “Happiness” above my desk. 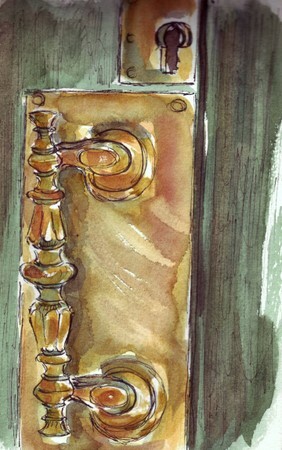 …a pretty porcelain handle to the bathroom and last but not least, the heavy brass handle from the large green painted wooden gates. It is always tarnished but looks glorious once it is cleaned. Which happens only when I need to get rid of bad energy. Then I’m stuck with a tennis elbow for the next 6 weeks. There are still more doorknobs and handles and levers and keys, but I’m done now with doorknobs being a thing of art. I agree with you about the door knobs. How wonderful you get to have all different doorknobs! Great drawings. Nice touch including the things hanging on the doorknobs. What a MARVELOUS collection of door knobs and accessories! I loved reading about your experiences with them and the drawings. Just wonderful! rful post, Ronell. 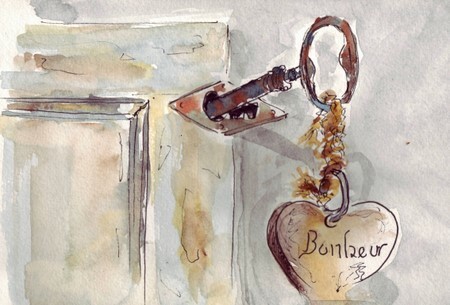 Your watercolors are really good – and I had fun trying to recognize each doorknob. I enjoyed the tour of your doorknobs. What a wonderful home ful of art you’ve created! Oh my goodness, you have been busy! I love how you’ve done this as a series of doorknobs. 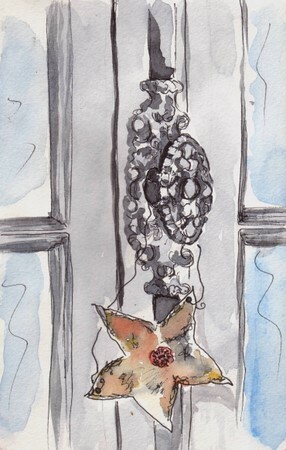 Beautiful lively illustrations – I love the way you’ve used the watercolour wash so loosely. What a great house you must have! I love these. Thank you everybody, for the kind comments…they are much appreciated, like always. What a wonderful collection and fabulous watercolor paintings of them. Thanks for sharing your house with us. 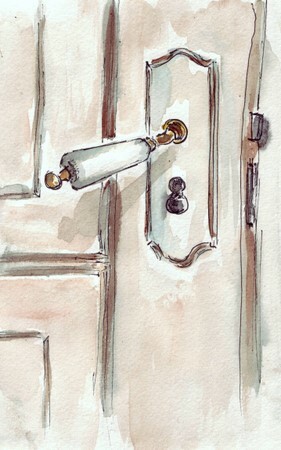 What a WONDERFUL doorknob study — to say NOTHING about your FANTASTIC rendering of them!!! WONDERFULLY DONE …exquisite execution! Such an enjoyable collection of sketches! Ok these are good – very good. A fabulous collection of doorknobs. Your style works so well with the subject. Great colour. Lovely work. Oops, sorry I added that extra ‘e’ to your name, Ronell. Old spelling habits die hard ;D.
I just don’t know what I like better, your watercolor paintings of your door knobs or your ideas how to decorate and style them. Both of them wonderful! Thanks so much for the beautiful praise on what I’ve done here, it is so encouraging! These are SO COOL! Each painting is unique, and beautiful, and kudos to you for deciding to do a series about the humble doorknob. Love them! What a lovely door handle series! What a lovely home you must have and the door handles are so unique. What year was the home built? They’re all wonderful, especially the last one with its gorgeous colours. How cool! These are beautiful paintings and such interesting subjects. Ronell, this is wonderful. I love the watercolors. They are so bright and brilliant. Thank you for the great encouragement and praise..I appreciate it!